Why is buckwheat porridge healthy? Buckwheat porridge is a treasure trove of health, it is rich in magnesium, niacin and fibre and is an ideal food for a healthy breakfast, and we would say that it was one of the morning treats, healthy and very tasty. To make a porridge of buckwheat tastier you can sweeten it with dried fruit and homemade honey, sugar because other artificial sweeteners we would not recommend. We will give you a few suggestions on how to surprise your household with this delicious and healthy breakfast, which will give you strength and energy for the whole day, so let's go. Since it contain valuable minerals and vitamins, buckwheat porridge for breakfast will provide us all the necessary energy for the whole day, especially when served with fruit. In its composition there is about 0.2 percent of plant sterols, which effectively prevent the increase of bad LDL cholesterol. 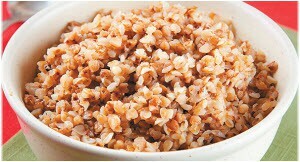 Buckwheat porridge contains up to 75 percent complex carbohydrates. It is considered an excellent source of dietary fibre, which helps accelerate the metabolism, triggering our slow and lazy bowel and thereby influencing our weight. It contains 25 percent of crude fibre in itself, which is a boon for our entire digestive tract. Rich in flavonoids it keeps cholesterol under control and lowers and balances blood pressure, strengthening weakened capillaries. This healthy breakfast does not contain gluten, and is generally accepted by people who are suffering from celiac disease. Be sure to include this porridge in your menus, you cannot go wrong. Porridge with buckwheat is safe to give to children to start the day, teens often in the morning skip the meal, because as we often say "forget to eat", which is not good. All of the porridge will be very helpful as a morning treat, and it can be eaten by those suffering from diabetes. Delicious and crunchy buckwheat porridge with the addition of fruit is right for the start of a long day. To start, you need to put buckwheat in the water and let it rest throughout the night. If you are making buckwheat porridge just for yourself, it will be enough to soak about handful of buckwheat, if you prepare a portion for two people take twice as much - two cups. In the morning give it a good rinse. Extradite buckwheat in a pot, add a little salt (a pinch), and pour the water so that the buckwheat in the pot is completely covered. Buckwheat mash is then cooked slowly, until you see that it softened, if necessary add a little water, so it does not boil. Continue to cook and mash by adding dried figs, bananas, plums or apples, and gently cook for another 3-4 minutes. Now turn off the heat and pour porridge with a little milk of your choice and serve. Thus made buckwheat porridge can also be prepared with local honey and you can be free from the top to sprinkle a little cinnamon. Enjoy its full taste and smell, fantastic! These grains have a low glycaemic index - slowly releases sugars, which will certainly give an extended feeling of satiety, which is why it is reasonable that buckwheat porridge for weight loss is recommended to obese people and those who need to take off the extra pounds of fat. This food is ideal for all of people who pay attention to daily caloric intake. Fats contained in this food are very healthy because they are unsaturated, and include lecithin, an extremely useful ingredient for the development of children. In 100 grams of porridge there is about 343 calories, is an excellent source of vitamin E, as well as phosphorus, magnesium, pantothenic acid, niacin, precious vitamin B2, iron and potassium. Except for breakfast, buckwheat porridge can be used as a side dish like an addition to rolled cabbage, moussaka and other popular dishes. It is best to buy it in health food stores.